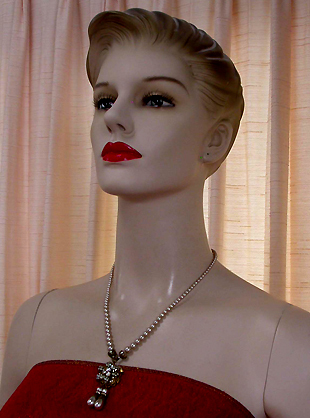 VINTAGE COSTUME ESTATE ANTIQUE JEWELRY NECKLACES! 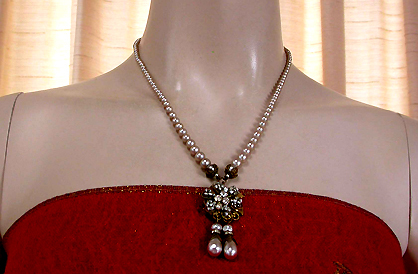 Early Unsigned Miriam Haskell Faux Pearl Clear Paste Filigree Gilt Brass Vintage Antique Estate Necklace With Floral Pendant For Weddings, Proms, Pageants And Parties! 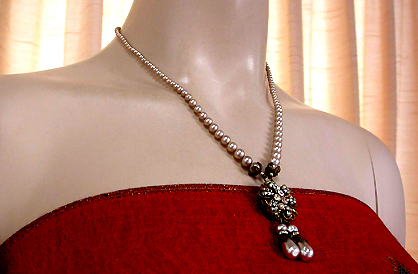 Item #N168406 - Early Unsigned Miriam Haskell Faux Pearl Clear Paste Filigree Gilt Brass Vintage Antique Estate Necklace With Floral Pendant. Designer: EARLY MIRIAM HASKELL UNSIGNED BEAUTY. 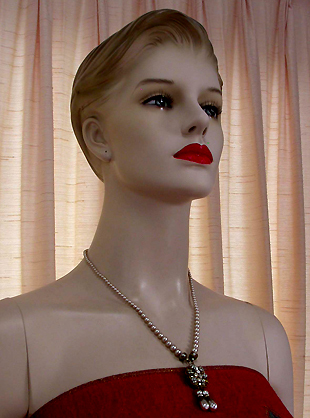 Exquisite early unsigned Miriam Haskell faux pearl necklace with floral pendant! 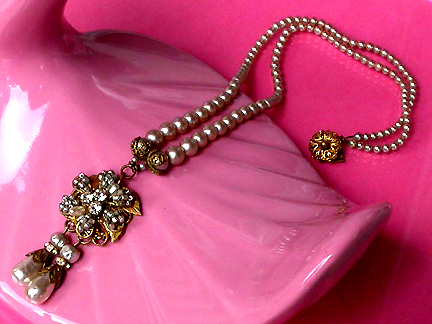 The Miriam Haskell's high-quality lustrous glass cream pearl graduated strand ends a detailed filigree gilt brass rosette push-in clasp. 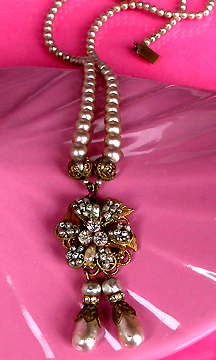 The front has two filigree gilt brass capped round pearls from which an exquisite floral pendant is hung. 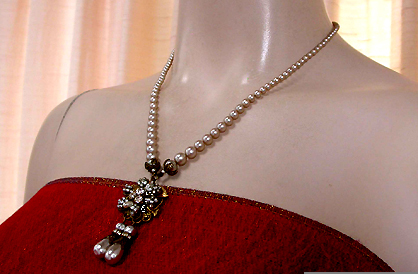 The intricately designed flower pendant has wired silvery seed pearl petals and three brilliant clear paste pronged stones on ornately etched gilt brass leaves mounted to the double layered filigree gilt brass base. 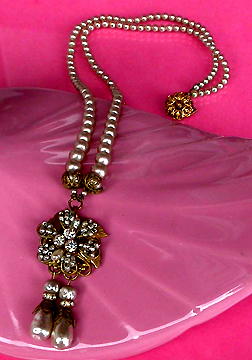 Then further suspends twin gleaming baroque pearl drops capped in filigree brass with glistening clear rondell accents. 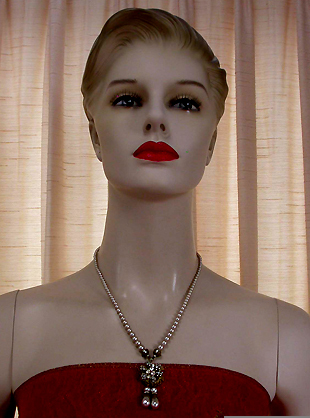 No peeling of pearls that the naked eyes can see, in rare excellent vintage condition! A true treasure from the past! 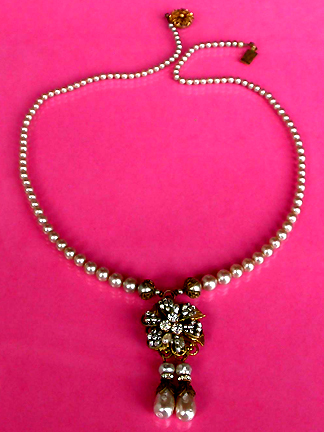 A fabulous necklace to wear at weddings, prom nights, pageants, parties, cruises and special functions! US$498.00. SOLD.